If your videoconferences are looking less like business meetings and more like experimental movies with disconcerting jump cuts, choppy action, out of focus participants and the camera often aimed off into space, the solution is within sight. 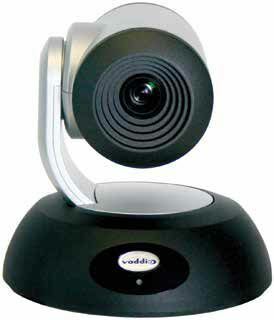 Vaddio’s RoboSHOT 12 QUSB camera system not only delivers an exceptional video stream and can be remotely panned, tilted and zoomed, but is flexible enough to work with just about any video conferencing gear. Inside the silver RoboSHOT 12 is a broadcast-quality video camera that uses Sony’s Exmor CMOS 1/2.8-inch imaging sensor. It can capture 1,920 by 1,080 resolution video streams at up to 60-frames a second, but can be downgraded to 720p resolution. The camera’s 12X optical zoom lens can take in up to a 73-degree horizontal field of view. The company also sells the more expensive RoboSHOT 30 camera that mirrors the RoboSHOT 12 specs, but has a 30X optical zoom and a tighter 65-degree field of view. This makes it more appropriate for a larger videoconferencing room, a lecture hall or a house of worship. It costs between $5,800 and $7,000 versus $4,600 to $5,800 for the RoboSHOT 12. At 6.9- by 7.0- by 6.7-inches, the RoboSHOT 12 is small, but it has a heavily weighted black base that should stay put no matter how much table-banging goes on. Rather than self-contained VC cameras, like JVC’s GL-LS2WE, the RoboSHOT 12 requires a Quick-Connect camera control unit that measures 1.7- by 8.3- by 6.1-inches. This allows the RoboSHOT 12 to be in the video room while its electronics can be set up alongside, in a control room or anywhere within 100-feet of Cat-5 or -6 network cabling. The camera comes with a threaded mounting point underneath as well as hardware for attaching the RoboSHOT 12 to a wall. Vaddio also has a full line of accessories that can make the camera disappear into the background, such as an in-wall niche frame and a variety of dome enclosures. A gem of modern engineering, the RoboSHOT 12 Tri-Synchronous Motion Drive powers several motors at once for smooth professional- looking camera motion, even when moving the camera diagonally. The speed of tilting, panning and zooming can be controlled with presets for different uses. The RoboSHOT 12 QUSB system that I looked at has a pair of RJ45 jacks for connecting the camera to the system’s Quick-Connect USB control box, which can power it as well as send video data. There’s also a connector for linking the control box with the facility’s network. To connect over a WIFi network, you’ll need to use a wireless LAN adapter. Along the back, the control unit has HDMI and YPbPr DE-15 connectors for sending the video to a monitor or projector. Its video stream can travel over a USB 2.0 cable or through networking cables using the H.264 spec to a computer or dedicated video conferencing equipment. Vaddio sells several other Quick-Connect sets with the same camera but different control boxes for everything from network-based videoconferences to ones that require outputting the video in DVI and analog formats as well as a USB-based Mini model that tops out at 720p at 30-frames per second video. Unlike the JVC GL-LS2WE, the RoboSHOT 12 lacks a built in microphone or audio inputs, but Vaddio has separate audio options. If your network uses DHCP automatic IP addressing, once the camera is plugged in to the control box and started up, its IP address and MAC addresses are displayed on the box’s monochrome display. The beauty of the RoboSHOT 12 is that it is so easy to set up. With only a glance at the manual, I was able to get it up and transmitting video in about two minutes, a record for me with this class of gear. The reason is Vaddio’s built-in web server that, like networking routers, presents pages of configuration details to a connected computer. Logically laid out, the system works with recent Chrome, Firefox, Internet Explorer, and Safari browsers, but the dark blue and black color scheme of the set-up pages can make reading items a little hard in the dark. A big bonus is that it worked just as well with a desktop, notebook and tablet. If your network uses DHCP automatic IP addressing, once the camera is plugged in to the control box and started up, its IP address and MAC addresses are displayed on the box’s monochrome display. Aim a browser window at that IP address and the main control screen will show up for remotely moving the camera up and down, right and left as well as diagonally. You can also zoom-in and -out of the image at the click of a mouse or tap of a tablet screen. The screen lets you correct for fluorescent or incandescent lighting and set up a dozen camera presets, but doesn’t have an online preview of the video stream. The camera is compatible with Crestron and AMX control. If you don’t have an operator to keep the camera’s position on the speaker, the RoboSHOT 12 comes with an infrared remote control for aiming the camera. Administrators can open a deeper layer of password- protected configuration screens that show the details, including adjusting the camera’s Chroma, gain and white balance. You can even give the RS12 a name, location and static IP address, but there’s no way to automatically load a common configuration across a company’s worth of RS12 cameras; Vaddio is working on being able to do this. While using the RoboSHOT 12 for several videoconferences in a 9-foot wide room, its video quality was exceptional with excellent focus, exposure, color balance and sharpness, putting other VC gear to shame. The action doesn’t lag and is free of objectionable motion artifacts, even when the lens was zoomed all the way in. In addition to faithful representations of human faces, it worked well at capturing objects, like machine parts, close up. It can deliver a usable image in as little as 1 lux of light and doesn’t get washed out when bright lights are aimed at it. The irony of using the RoboSHOT 12 for videoconferencing is that after a week of daily use, I came to the conclusion that it raises the bar so high that if you don’t have one of these cameras at either end of the video conversation, one side is getting cheated. A great way to turn a room into a videoconference center, the RoboSHOT 12 combines excellent video and the flexibility to set it up exactly the way you want it. At $5,500, however, it is pricey compared to JVC’s GL-LS2W camera, which sells for less than one-fifth that, but neither offers its smooth motion nor its variety of outputs. In other words, the RoboSHOT 12 camera can turn videoconferencing disappointment and frustration into the genuine business tool it was meant to be. Brian Nadel is a regular contributor to AV Technology magazine.